It's very easy to find lots and lots of famous dyslectics on the net. I just had to google for a few minutes to find these, and I've only included names I recognize. The problem with this list is of course not that it includes many intelligent or extremely intelligent and successful people, the problem is that there are so many people on it who were not dyslectic. What does it take to include someone - is it enough if anyone anywhere just says so, or is there any kind of evidence involved? Who made the conclusions in the first place? And how do you diagnose someone who died centuries ago? Here are some people claimed to be dyslectic who weren't. Albert began to speak somewhat late, according to himself his parents took contact with a physician: "How old I was I can't tell, certainly not under three." It's obviously a relief for worried parents, and worried kids as well - Valentin tells about young relatives of the Einsteins who where told about their famous uncle Albert who began talking so late - but it isn't extremely late, and it is certainly not a sign of dyslexia. There is a rumour that Albert still couldn't speak properly at the age of nine, which is just as false as the statement that he couldn't read at the age of nine, which in turn is just as false as the statement that he couldn't lace his shoes at the age of nine. He did have an admittedly late development of speech, little interest in playing with other kids, and some kind of frenzy. The psychoanalyst Erik H. Erikson concluded after studying the case that at least the speech problem could "be symptomatic of a defect in his development", and that similar cases today would definitely deserve attention or even treatment. But it is hardly possible to make a better diagnose now, and Erikson had nothing to say about the case when Albert had finally acquired his language; the problems had apparently ceased when he got to school, which is indicated by the fact that he began in the second grade. He certainly didn't like school, some of the teachers certainly didn't like him, and at times he was downright sloppy - not the perfect student, but that didn't stop him from doing well when he felt like. Yesterday Albert got his grades, he was primus [ best in class ] again, he got excellent remarks. ...in Latin always had at least the grade 2, and in sixth class even 1, the highest grade. In Greek he had the final grade 2. [...] Never in the 'secret remarks' does anyone complain over his abilities in languages. The school archives were destroyed in the bomb raids during World War II, so this letter published in Münchner Neueste Nachrichten on March 14, 1929, on Alberts 50th birthday, is the single piece of evidence we have regarding this part of his education. We do, however, have the grades from his next school, the school of the swiss kanton Aargau. Here are the grades that are most typical and/or most important for his career. As Wieleitner wrote, 1 is the highest grade. Then this is surely a great student who suddenly turned into a terrible one? No, since in 1896/97 the grades were inverted in order to conform with the final "maturity examination" (Maturitätsprüfung), so you just had one kind of grades to worry about instead of two. After that, 6 was the highest grade and 1 the lowest. Alberts grades, including the ones I have omitted here, show nothing like a catastrophic descent; indeed, the 96/97-I. grades are almost identical to the 95/96-IV. ones. A myth is born! Does his good grades in German prove that he wasn't a dyslectic? No, dyslectics can have excellent grades in language (as has been pointed out for me). But the point is that his supposedly bad grades is the only evidence for his dyslexia. There is a rumour that Einstein needed help with his math by a professional mathematician. That is not completely untrue, but misleading. Albert mentions that he choose not to study advanced mathematics since he thought that as a physicist he could do with a general idea of it, a notion he later realized was wrong. His old friend Marcel Grossman, who also happened to be professor in mathematics, assisted him with some of the math involved in the general theory of relativity, but then we're speaking about advanced math indeed, the kind you certainly don't have to be a dyslectic to have trouble with. I've found one (1) indication that anything at all was unusual with the linguistic abilities of Albert as an adult - here on answers.google.com a study from the University of North Carolina "20 years ago" is mentioned, that apparently showed that Einstein had strephosymbolia, which means that you mix letters in words in tihs way. With regard to the "bad grades" this sounds suspicious, but since I haven't read or even found anything else about this study there isn't much I can say about it. Three signs of the dyslexia of Leonardo: He did "mirror writing", his spelling was peculiar, and most importantly, he described himself as a "man without letters". According to Bramly it is estimated that Leonardo wrote something like 13000 pages during his lifetime, of which 7000 are preserved. That should offer ample possibilities to prove or disprove his dyslexia. Leonardo was left-handed, and it's worth noting that this usually was viewed with suspicion at the time, though there are no signs that it ever was a problem for him. Though there are many left-handed dyslectics who do mirror writing, it is in no way a certain sign of dyslexia; for children learning to write it's the norm, even for right-handed children. But Leonardo could write from left to right as well as from right to left, the latter was just a little bit easier for him. He didn't have to acquire it by practice, neither was he forced to. That his mirror writing should have been a simple code is plain silly, since anyone who can read at all can identify mirror writing as such. If someone like Leonardo had something to hide he would of course have done so with far more subtlety. Why do people who write like me write from left to right? Because the hand moves across fresh paper, so you won't mess up your writing - provided you're using your right hand, that is. So there is a good reason for left-handed people to write from right to left. Leonardo's spelling considered "strange and full of errors"
Leonardo used a kind of shorthand of his own invention. I haven't found any good description of how it worked, or even a decent example. Considering his intellectual abilities it is not hard to imagine him having ideas regarding the improvement of writing. As for the errors, you can only spell wrong if there is a spelling considered right. Such norms didn't exist in those days, at least not for common languages - dictionaries and grammars existed for latin and greek, not for e.g. italian. It was actually quite common to vary your spelling, even in the same text, something many dyslectics certainly would approve of. Isn't this an attempt to give a name to dyslexia? No, this is very simple - it's a translation error. What is un uomo di lettere? Someone who can write? No, it's precisely the same thing as spanish hombre de letras and french homme de lettres, that is, "a man of letters". When Leonardo used the negated expression, he didn't mean he couldn't read or write, he just meant that he lacked formal education. It's the very same argument you use when dealing with experts: "I'm no expert, but..."
Leonardo got his first education in the workshop of Andrea del Verrocchio, which was a place of many crafts like painting, sculpting and so on, but not of books. He didn't, for example, get to learn latin, which of course was a must for any "man of letters"; he did learn it by himself in his forties. He certainly made up for his lack of education in other areas as well, there are lists of over 170 books he read, and he sometimes owned more books than many scholars of the time. Since he never went to school he never got the opportunity to show off his dyslexia, so to speak, but the current evidence should do well enough. Winston Churchill was not dyslexic, had no learning disability whatsoever. In his autobiography he played up his low grades at Harrow, undoubtedly to convince readers, and possibly himself, how much he had overcome; but in this he exaggerated. He was actually quite good at subjects he enjoyed and in fact won several school prizes. The best source on his actual school performance is Jim Golland's Not William - Just Winston (Harrow: 1988), still available from the Harrow School Bookshop. The single source I think I need here is a biography by Marc Eliot; it's title, Walt Disney: Hollywood's Dark Prince, is a good indication of the level of this quite sensational and not very trustworthy book. The slightest hint of Disney being a dyslectic I wouldn't have given much thought, but since Eliot on this matter for once doesn't try to paint him in the darkest colours available, he turns out a lot more credible. Perhaps a desire for revenge was behind the rumour from the Hyperion studio that spread in Hollywood, that Walt couldn't even write his own name, and that his famous signature and the logotype of his company was one of the many creations of Iwerk that he didn't get any credit for. In those days, Disney's films never mentioned the people who hade made them, it was always "Walt Disney presents" and nothing more. Ub Iwerks spent quite a lot of his career at Disney, and was arguably his most skilled artist, but even he didn't get any official credit for his work. He was, even according to more reliable sources than Eliot, responsible for quite a lot of the look of Mickey Mouse, and of course the famous signature of Walt Disney. Ub gave it a bit more style, and Walt then tried to learn the modified version. This would indeed explain some genuine signatures produced by Walt, some of which are not remotely similar to the well-known logotype. Signature on a contract from 1948. 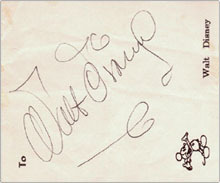 Autograph on a drawing from Alice in Wonderland, finished in 1951. 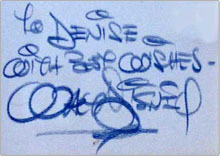 Autograph from 1962 or 1963. To conclude: Walt was not such a good cartoonist as many think he was, but he certainly had no trouble writing or reading. This is a simple one, methinks: Considering Steve being the founder of Apple and God for legions of Mac-evangelists, I expect the slightest amount of dyslexia to be well documented on the net. Since I find absolutely nothing, I presume there isn't anything to document. The purposes of listing celebrities with dyslexia are obvious: Encouraging dyslectics, kids who think they might be dyslectic and their parents, and to show dyslectics and non-dyslectics alike that dyslexia have nothing to do with stupidity or laziness, and that there are indeed many highly intelligent dyslectics who have succeeded very well in life. But the best of purposes can never be an excuse for bad or non-existent research. On the contrary, it suggests that you have to tamper with facts to get a good collection of famous dyslectics, which is not only untrue but can (worst of all) be interpreted as an indication that what one is trying to disprove is actually true.